Imagine yourself on two separate trips to a popular tourist destination, let's say... to Paris. Trip A is planned to the minute, maximizing your time, allowing you to see every landmark, statue, and sidewalk cafe recommended by your travel book. When you meet a few Paris natives who invite you out on the town for the afternoon, you decline because it doesn't fit into your itinerary. Trip B is not planned. At all. You wander the streets all day shopping, soaking up the culture, and you sit outside all evening sipping wine and staring at the Eiffel Tower. On the last day of your stay, you realize you forgot to visit the Louvre, the Arc de Triomphe, and the restaurant your friend recommended. Do you see the pros and cons of both trips? Now let's look at the parallels between our Paris trips and organizing our Guided Reading Groups. If we do it like Trip A, we are going to get a lot done. We're going to meet with the maximum number of groups possible. We're going to stick to the plan, come heck or high water. We're going to have a pretty-looking board that never changes because it's a house of cards. We're going to teach each group what's next on the plan, regardless of whether they are ready for it, and we're going to get stressed when an unscheduled school assembly pops up and dominoes start crashing all over the place. But if we do it like Trip B, weeks will slip through our fingers like sand. We may not meet with our high groups until next week, because hey, they'll be alright. (And we'll likely say the same thing next week.) However, we will be responsive to our readers, teaching them what they need at that particular moment, partly because we've got nothing else planned. Soon we'll feel stressed because of the randomness and the lack of direction. What we need is a balance of both. We need structure to give us a big picture view and so our students know what to expect, but we also need flexibility to allow us to be responsive and to make changes without causing a flood of other problems. I'm here for you. Let's walk through this together, so we can prevent the headaches caused by either extreme, and so we can get a system running that allows us to do what we were meant to do: guide readers. Before we make any sort of weekly schedule for meeting with small groups, we need to gather enough information to feel comfortable with an approximate guided reading level for each student. I like to have multiple points to consider. 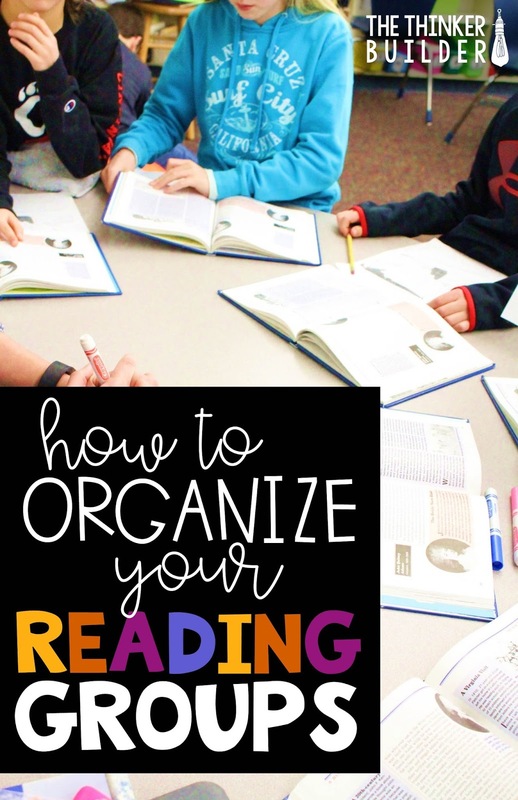 These may include required district assessments and scores and levels from the end of the last school year, but definitely should include our own observations of each student reading, whether it be through a running record or an informal reading conference. I'll use a make-believe class of 27 third graders. Across the top I labeled a spectrum of guided reading levels, from J to S in this case, and then I wrote each student's name underneath. You can see I felt like many students are split between two levels. That's okay. Now let's group students with similar levels. Generally, we're looking for groups of 4-6 students, the lower level groups with the lowest numbers. 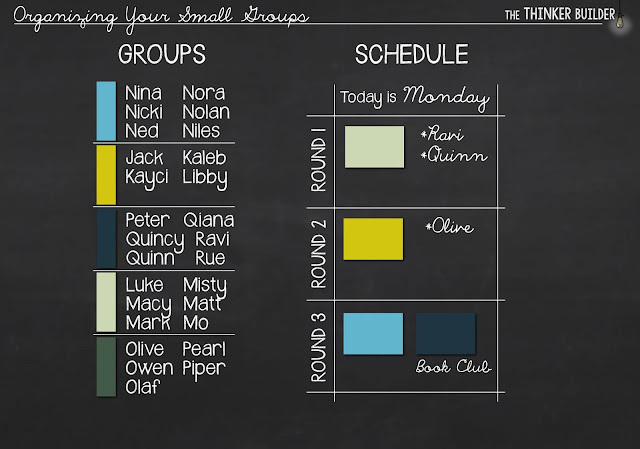 As a stepping stone to constructing a reading group schedule, next we're going to figure out how often per week we want to meet with each group. Remember that fair is not always equal here. We want to meet with below-grade-level groups more often than other groups, and our higher groups may do some of their reading "away from the table" to make up for fewer meetings. I've assigned each group a color. Then I've drawn a box for each reading group "time slot" for a standard week. Use the literacy block schedule that you sketched out to help you determine how many time slots you'll have per day. (Need help making a literacy block schedule? Click HERE.) I'll use a 3-per-day model, which means I'll have 15 slots for the entire week. I started with giving my lowest group five slots (one per day) and went from there. But now we need to remember the idea of balance. If a "standard" week has every slot filled, we are setting ourselves up for inflexibility and stress. So let's build in a few "flex" slots. We'll pencil-in a group meeting for these times, but we reserve the right to use them for other purposes. Here's an example with 3 flex slots. Did you also notice that the groups are all listed on the left? I put a colored strip of paper next to the names, to match up with the groups' colors, but I always write the names on the board itself (as opposed to writing or printing them onto the colored paper) to add flexibility. This way I can make adjustments easily by simply erasing names and rewriting them elsewhere. Also notice that I did NOT list the groups in the order of their levels. Let's not make it obvious, right? Do you remember our three flex slots? Let's see what our schedule might look like if we incorporated them. You can see three strategy groups in place of reading groups. 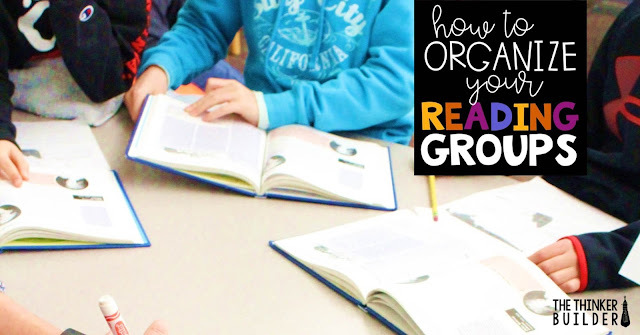 These strategy groups are pulled together based on specific needs not necessarily related to reading level. For example, we notice Olaf, Mo, and Mark are having trouble understanding cause and effect, so we pull them together for a strategy group. Wow, there we go again, using the flexibility in our schedule to be responsive to students. If you feel good, let's call it a day. But if you want, let's take a different group of 27 kids through this process and see what changes. Did you notice Ravi way out there at level R/S? Sometimes that happens, where one student doesn't really fit with a group. What we'll do is go ahead and list Ravi with Pearl and Quincy's group, and he will meet with them sometimes, in order for him to have collaborative opportunities. But Ravi and I will also meet one-to-one (using our extra 3 minutes per time slot that we are saving) so we can use higher level texts. We choose a color for each group, and we fill our slots. With more students below grade level, the sessions are spread a little more evenly. Then we can put together a schedule. Notice how Ravi has three short individual conferences planned. And remember that a few of these slots can be flexible if we want them to be. Let's revisit the key point. Remember that in real "school life," there is rarely a perfect week. So when we set up our guided reading schedule with the expectation of perfection... absolutely no interruptions, perfect timing, and students soaking up our instruction like sponges: anything short of that begins to feel stressful. Can you sense the oncoming headache? 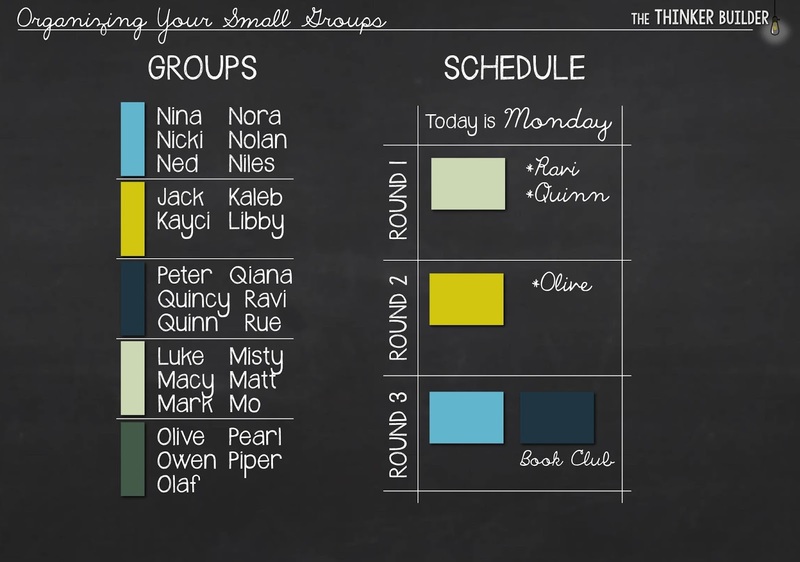 So let's design our small group schedule with enough flexibility that we can adjust our timing and teaching as needed. Maybe those perfect weeks will come, and if they do, we'll be ready for them, because we will be ready for anything.